This letter was written by 19 year-old Pvt. William Wallace Chickering (1843-Aft1880) of North Andover, Essex County, Massachusetts who served in Co. G, 11th Massachusetts Infantry. William (“Chick”) was the son of Charles Chickering (1805-Bef1860) and Priscilla Wallace (1810-Aft1880). On-line genealogy records indicate that William and his only sibling Caroline Amanda Chickering (1835-1900) — mentioned in this letter — were born in England. William still resided in his mother’s boarding house in North Andover and was an apprenticed machinist when he enlisted and mustered into the service in June 1861. William was taken prisoner on 29 August 1862 at 2d Bull Run. 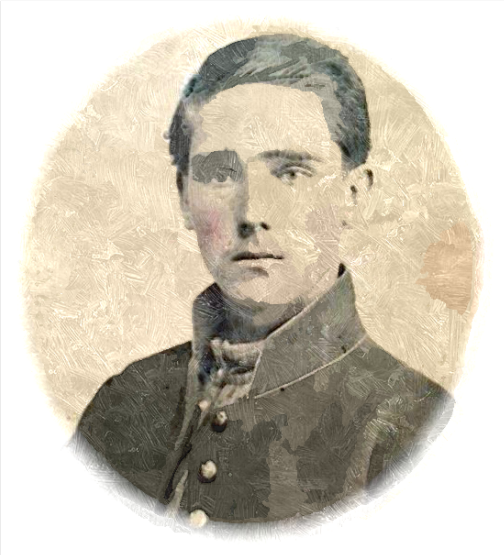 He was promoted to corporal in April 1863 and wounded on 27 November 1863 at Locust Grove, Virginia. He was mustered out of the company on 24 June 1864. Yours received last night was very welcome indeed. It is just time for “afternoon smoke” now and very warm — so much so that it is disagreeable with a blouse on. This will seem strange to you but it is so. We sweat a good deal while drilling. Things are beginning to look green out here and men to get poor. I can’t weigh over 151 lbs now the best I can do — 9 to 12 less than I used to. Am going to have my head shaved again today. Brigade drills still rage here. General court-martial setting in the camp of the Massachusetts 11th. No movement yet and I am of the opinion that we shan’t move at all though most of the boys think differently. It wouldn’t surprise me at all if we celebrated 4th of July here in Chickamuxen [Charles County, Maryland]. Perhaps the next march we make will be to Washington on our way to Boston but I don’t suppose we shall see that city for a year yet. What do folks at home think about the war? I mean how long do they think it will last? Suppose you hear about Island No. 10 every day. We do anyway as we get the Baltimore Clipper each night. If you have read much war news, you have seen the account of the concentration of the rebels at Corinth, Mississippi, and the expected advance of our troops upon them. Upon this battle depends a great deal. If we whip them there, the Mississippi Valley is ours. New Orleans and Memphis, Tennessee — Island No. 10 too. And so much of a loss will dishearten the rebels in the Southwest says the Clipper. To this battle then we are all looking, knowing that a victory for us there will probably shorten the war considerable. A defeat would put us back two months at least. So you see we are all anxious to hear from Corinth soon. Let us hope for a victory anyway. The men are all getting the spring fever. You know what that is, I suppose, but I don’t — only that the doctor calls it that. Jerry had the typhoid lightly. He is back here now but not well enough to do duty yet. A. P. Cheney ¹ sent me some tobacco in a box that Blanchard’s folks sent to him from N. A. [North Andover.] Send word to him that I am very thankful to him for said tobacco. He says that he has loafers enough now but Chick and Len were the best ones he ever had round. He wrote a short letter. With regards to him, please mention me if you can send handily. About those pictures. If you can, I wish you would start them early next week. Yours and Cads can be enclosed in any letter so you send them soon before we go — if we go for at least two weeks I’m mistaken — but better be on safe side. A double case will cost about 15 cents more or less as the case may be. Do set it up in strong brown paper and take it to the [post] office and ask Pod how “much stamp” it will take to send that to me. Many of the company have had them come so and I guess there’ll be no trouble. You will be likely to get this as soon as you will the note enclosed in W’s letter as I don’t think his started out of camp till this morning. ¹ A. P.Cheney is listed as a grocer in North Andover in the 1872 Massachusetts Register of Merchants & Manufacturers. It appears that Chick must have worked previously as a clerk for Cheney. This entry was posted on Sunday, September 21st, 2014 at 5:56 pm	and posted in Uncategorized. You can follow any responses to this entry through the RSS 2.0 feed.